Running in shoes that fail to offer proper support to the arch cannot just lead to early wear and tear of the shoe, but also lead to aches and pains in the feet and adjoining anatomical structure. As it is rightly said, prevention is better than cure. Therefore, it is important to buy shoes that provide optimum arch support during exhaustive running sessions. 1 Why is it important to wear shoes with a better arch support? 2 How to buy a shoe with better arch support? 4.7 Why buy Brooks Glycerin 14 running shoes for arch support? 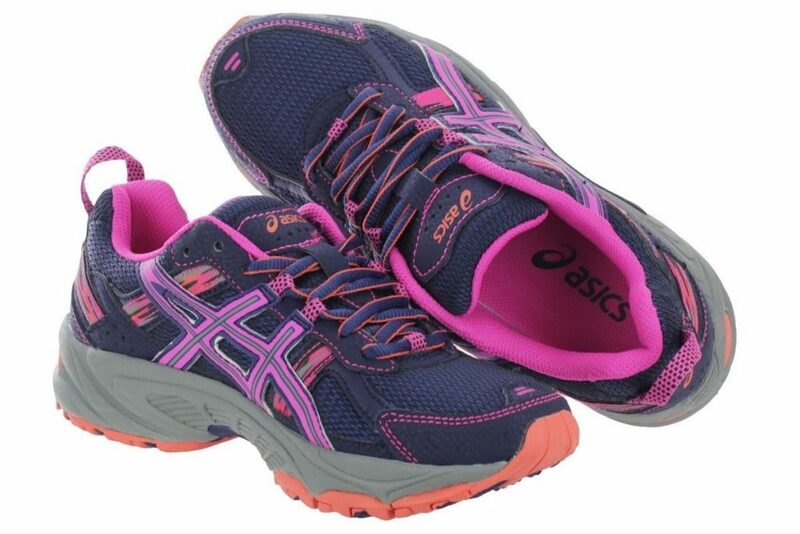 5.7 Why buy ASICS Gel-Kinsei 6 running shoes for arch support? 6.7 Why buy Altra Torin 2.0 running shoes for arch support? 7.7 Why buy ASICS Gel Venture 5 running shoes for arch support? 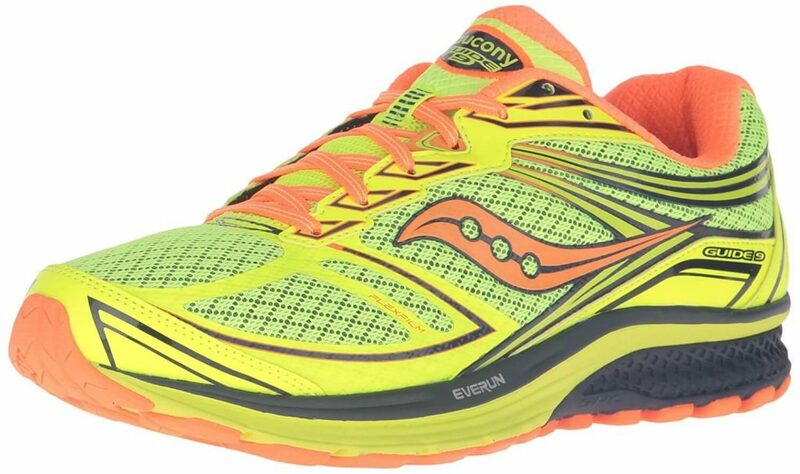 8.7 Why buy Saucony Guide 9 running shoes for arch support? Why is it important to wear shoes with a better arch support? They offer proper support to the fascia ligament. They are specifically designed insoles and midsoles for a better shock absorption. They offer better motion control to correct Supination or Overpronation to support proper walking motion. They are podiatrist-designed and ensure amazing comfort. How to buy a shoe with better arch support? If you are training hard in the wrong shoes, you can land yourself in big trouble. 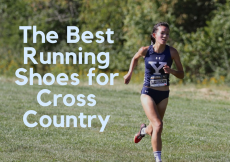 Therefore, it is important that you buy the perfect shoes for your extensive training and running sessions. The best shoes for arch support are those that follow the natural silhouette of the feet. So, while you go to pick shoes for yourself, select the best one based on these three parameters; support offered by them, the stability you need, and the control you can achieve wearing the shoes. To find shoes that can offer you excellent arch support, you must be aware of the formation of your foot’s arch. There are three kinds of arch types – high, neutral, and flat or low arch. For every arch type, there are specific shoes. To prevent injuries and get a super comfortable run, find shoes that blend perfectly with your arch type. You can test your arch type by an easy procedure at home. Just wet your feet and stand on a paper bag or a heavy paper. Step off the paper and look at the footprint. Your footprint will help you determine your arch type. Or, you can buy a gel pad from the market. For running, you always need shoes with good stability. Shoes with good balance keep the foot secure while running. If your feet turn inward or overpronate while running, you must look for shoes that offer extra stability. The most distinguishing feature of stable shoes is that they feature a medial post that protrudes into the shoes, to tone down the pronation rate as you run. Stable running shoes for arch support come with a thicker sole as compared to other shoes and have many overlays surrounding the shoes’ body to strap the feet down very securely. Motion control shoes come with a thick sole. They also feature a plush cushioning to prevent sliding around, as well as overpronation, while running. Runners who have low arch overpronate and so, they need high stability. The shoe comes with a strike point to accommodate bending of the toes. The shoes also feature overlays to ensure security and a midsole with lesser bending capabilities. Motion-controlled shoes ensure better stability, as well as security, to the runners. Be sure of your arch type before buying the shoes. You can consult your doctor or a shoe specialist for the purpose. Try different brands to select the one that offers the best fit. Consider buying insoles to ensure added comfort. Always consider safety first. You must prioritize safety over style. Now that you are aware of different things to keep in mind while purchasing running shoes for arch support, it’s time you should know which the 5 best running shoes for arch support are. 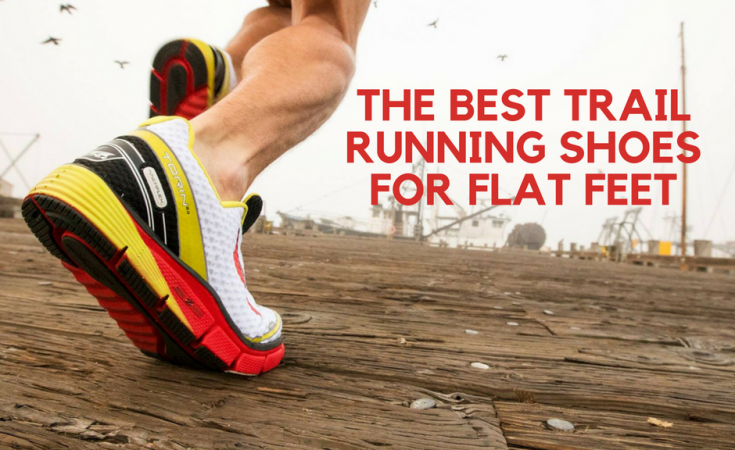 In this section, we will help you identify the best running shoes for arch support available for purchasing online. Let’s look at them one by one. Plush interior to offer a comfortable ride. Cushioned midsole to absorb high impact. Best arch support for neutral trainer. The outsole of Brooks Glycerin features a maze of rubber pods, as well as flex grooves. The rubber pods are placed strategically to form a pressure zone to enhance the shock-absorbing capacity. It also makes the ride very smooth and enhances flexibility. The heel features the use of carbon rubber. Blown rubber covering the underfoot offers better traction. The midsole of the running shoe features Super DNA which accounts for a better cushioning. The midsole is very lightweight and responsive. The midsole also has grooves placed strategically to increase the flexibility. The upper of the shoe is constructed of open mesh with few 3D overlays. The upper is quite breathable as the mesh features large holes. The midfoot saddle offers support and security. The padded tongue and the collar offer comfort which is further accentuated by sock liner. 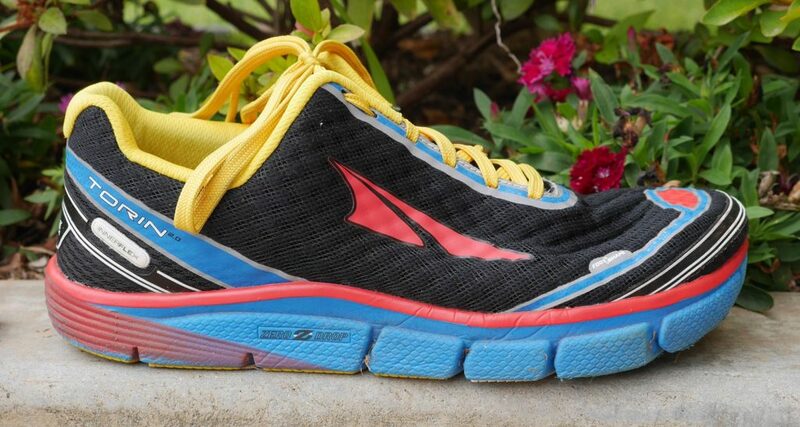 Why buy Brooks Glycerin 14 running shoes for arch support? If you are looking for running shoes for arch support with incredible cushioning, then Brooks Glycerin 14 running shoes for men and women can be your best choice. The upper body of the shoe is made of a breathable open-mesh based material with 3D overlays. The padded tongue and the collar offer extended comfort while running. If your running sessions are neutral and not very exhaustive, these shoes can work wonders for your arch support. Gender-specific midsole featuring technologies like Propulsion Trusstic technology, FluidRide 2.0, and the Gel Cushioning system to absorb shock and offer excellent cushioning. AHAR® or the Asics High Abrasion Resistant Rubber outsole. Spacious toe box for every kind of runner. Heel cup offering snugly fit. The outsole of the shoe comprises of the AHAR or the Asics High Abrasion Resistant Rubber which is very durable and also shields the sole from wear and tear. The rubber adds to the durability of the shoe. The deep flex grooves on the outsole offer greater flexibility. 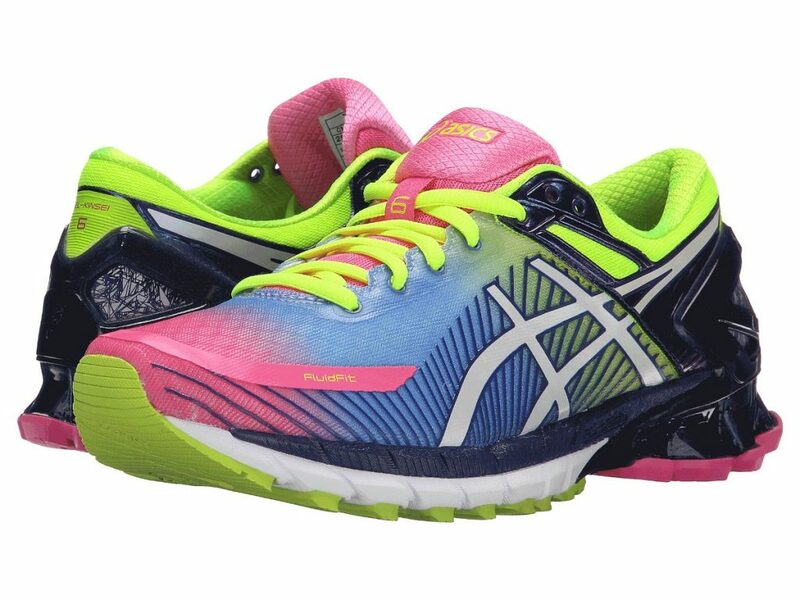 The midsole of ASICS Gel-Kinsei 6 brings in use various technologies to enhance the comfort of the runners. The midsole features FluidRide 2.0 which offers a springy feel under the foot. It is lightweight and offers a bouncy ride. The Gel Cushioning System absorbs all the shock and keeps the foot comfortable during landings, as well as liftoffs. Another technology used in the midsole is the Propulsion Trusstic technology. It works in harmony with the connective tissue of the foot. Before propulsion, it tenses and hence, the foot moves forward smoothly and swiftly. The upper mesh features FluidFit technology. The mesh is stretchable and excellently adapts to the shape of the foot. This offers a snugly fit. The seamless construction reduces irritation and blisters and hence, you can wear the shoe without socks. The upper also comes with the Heel Clutching System which is an external heel counter which accounts for support and security. It keeps the foot at a place while running. The ComforDry™ X-40 Sock Liner accounts for springiness and absorbs the moisture. Thus, the foot gets a healthy and breathable environment inside. 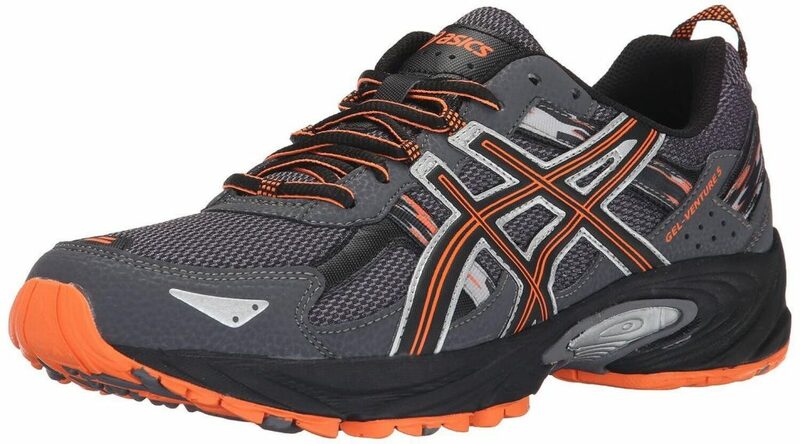 Why buy ASICS Gel-Kinsei 6 running shoes for arch support? 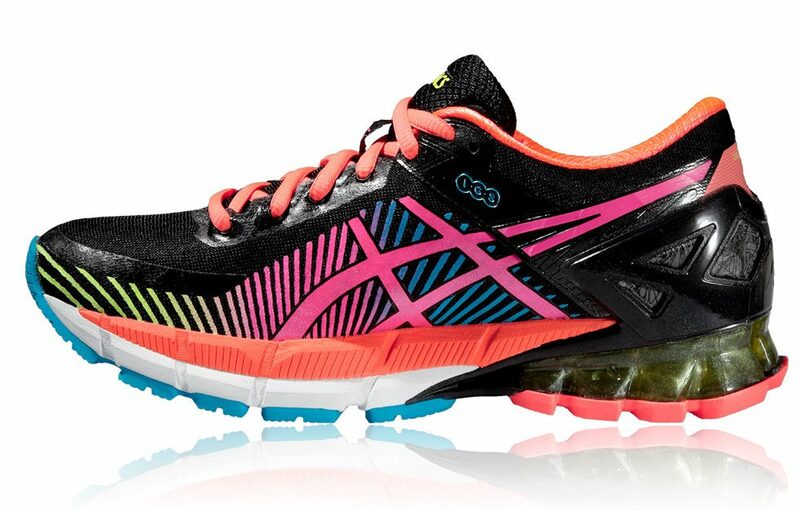 ASICS Gel-Kinsei 6 running shoes for arch support are one of a kind running shoes which come with gender-specific midsole. The Gel Cushioning System absorbs shock and provides extra cushioning to your tired feet. The upper-body mesh is stretchable and easily adapts to the shape of your foot. Highly recommended if you are looking for running shoes for arch support with great shock-absorbing capabilities. 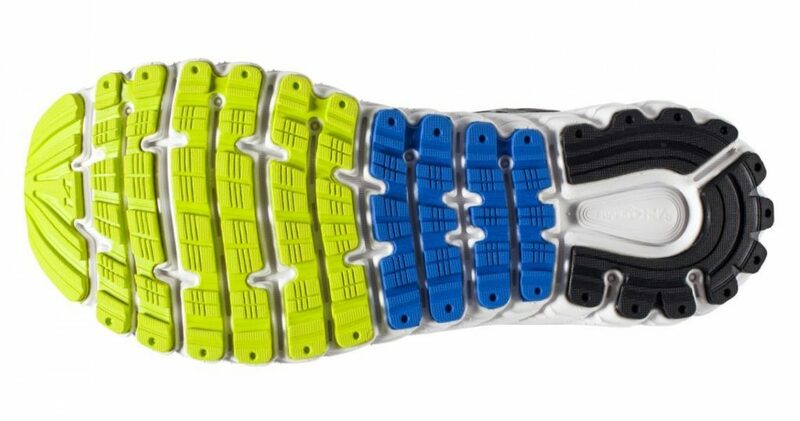 Use of FootPod technology in the outsole. Use of dual-layer EVA A-Bound midsole. Use of Innerflex technology, as well as Zero Drop cushioning. Quick Dry Air Mesh upper offering greater breathability. Rubber in the outsole offering better grip, traction, and durability. The outsole of Altra Torin 2.0 features FootPod technology whereby the shoe adapts to the anatomy of bones and tendons and hence, offering a natural movement. The use of tough rubber material in the outsole offers a greater durability, grip, and traction. 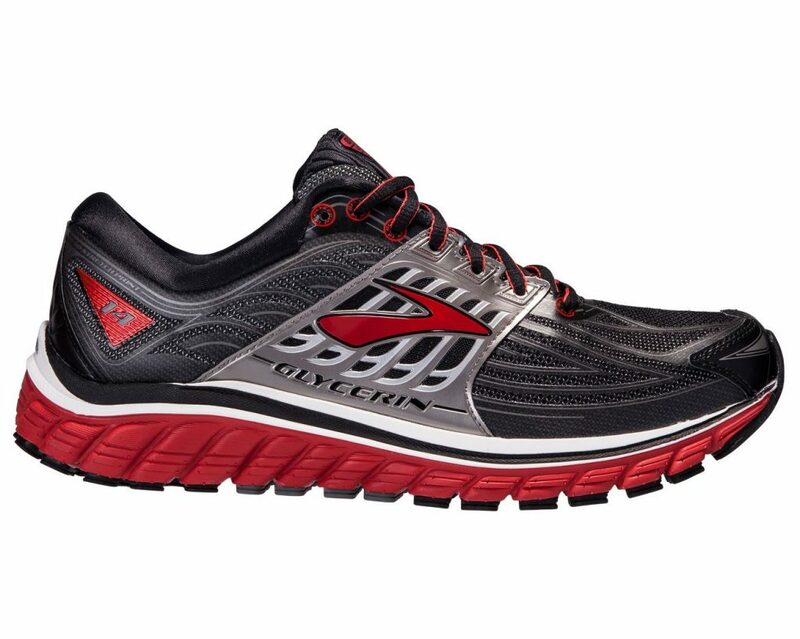 The midsole of Altra Torin 2.0 features dual-layer EVA A-Bound midsole that accounts for a better comfort. The midsole offers better cushioning. The midsole also features the Innerflex technology, as well as Zero Drop cushioning. The use of these modern technologies accounts for a greater balance, comfort, flexibility, and softness. The upper is very soft and comfortable. It features the Quick Dry Air Mesh upper which provides breathability and comfort. The padded tongue, seamless interior, soft sockliner make the shoe very comfortable to wear and run. Why buy Altra Torin 2.0 running shoes for arch support? 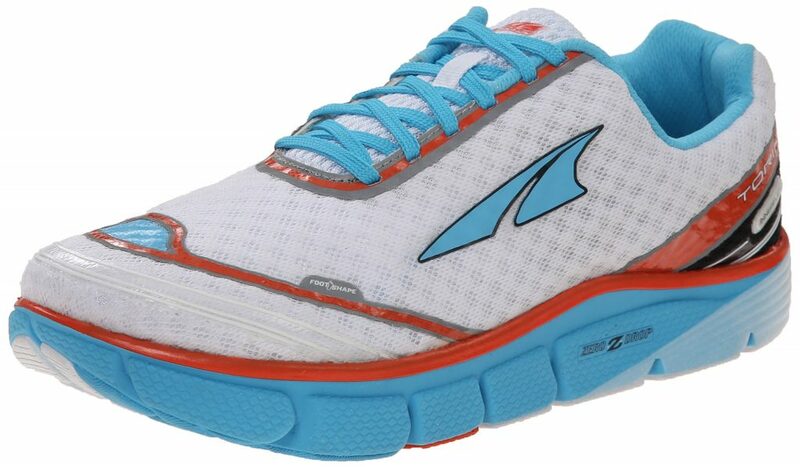 Out of the several different running shoes for arch support, Altra Torin 2.0 running shoes for men and women have unswervingly outdone the competition. With a tough rubber material outsole and Quick Dry Air Mesh upper, the Altra Torin 2.0 shoes will support the arch of your feet on all kinds of terrains. The best part about these incredible running shoes for arch support is that they come in an assortment of patterns and shades for both, men and women. AHAR or Asics High Abrasion Resistant rubber outsole with gripping lugs. Soft cushioning with molded EVA midsole. Use of Gel Cushioning System making the shoe best for heel strikers. Arch support helps in correction of supinated foot motion. Pull-tab to assist in wearing and taking off the shoe. The outsole of Asics Gel Venture 5 is made of the AHAR or the Asics Highly Abrasion Resistant Rubber which offers a better protection from wear and tear. The abrasion resistant rubber makes the apt for trails. The sole also features gripping lugs facing multiple directions. This offers a better grip on various surfaces. The lugs account for supported and controlled motion. The vertical and horizontal grooves on the outsole offer a smooth stride, as well as a flexible platform allowing the natural movement of the foot. The midsole of this running shoe is made of molded Ethylene vinyl acetate or EVA cushioning system. The system is very responsive and lightweight. It also enhances the shock absorbing capabilities of the shoe and hence, a smooth landing. The midsole also features the Gel Cushioning System on the rear section. The cushioning system reduces the impact of heel striking by absorbing the shock. This system is best for the heel strikers. The upper of this running shoe feature breathable mesh maintaining a better interior environment. The mesh is woven excellently and hence, you need not worry about wear and tear of the upper. The upper also features placement of synthetic overlays that are strategically stitched to offer structured support. The snugly foot wrap is attributed to the use of these overlays. They also protect the mesh upper. The use of synthetic heel, as well toe cap, prevent these sections from coming in contact with debris and hence, protecting the rear and the toes of the shoe. The inner sleeve also features breathable fabric which protects the feet from irritation. Why buy ASICS Gel Venture 5 running shoes for arch support? ASICS Gel Venture 5is one of the only running shoes for arch support on the market that can be worn with all types of feet arches. With a lightweight EVA midsole, it provides amazing shock absorbing capabilities. The Asics High Abrasion Resistant rubber outsole provides an incredible grip on rugged terrains. Highly recommended for trails. Not a great choice for those who have broad feet. Use of IBR technology which is lighter than blown rubber. Use of SSL EVA technology. SRC Landing Zone offering better shock absorption. The outsole of these running shoes comes with Injection Blown Rubber technology. The rubber is much lighter than standard rubber. It offers better cushioning and a very responsive ride. The outsole is also coated with a carbon rubber element covering the entire length. This provided better traction and extra durability. The Flex Grooves offer flexibility. The midsole feature EVERUN technology that accounts for an equal distribution of impact forces. The use of SSL EVA technology offers a great rebound. This reduces the weight and increases rebound, as well as durability. The SRC Landing Zone provides better shock absorbing capabilities and hence, smoother mid-foot transition. The upper is covered with FlexFilm which is a breathable and secure material. It also ensures a flexible fit. The RUNDRY collar lining offers better moisture absorbing properties. The ComfortLite Sock Liner offers a secure fitting. 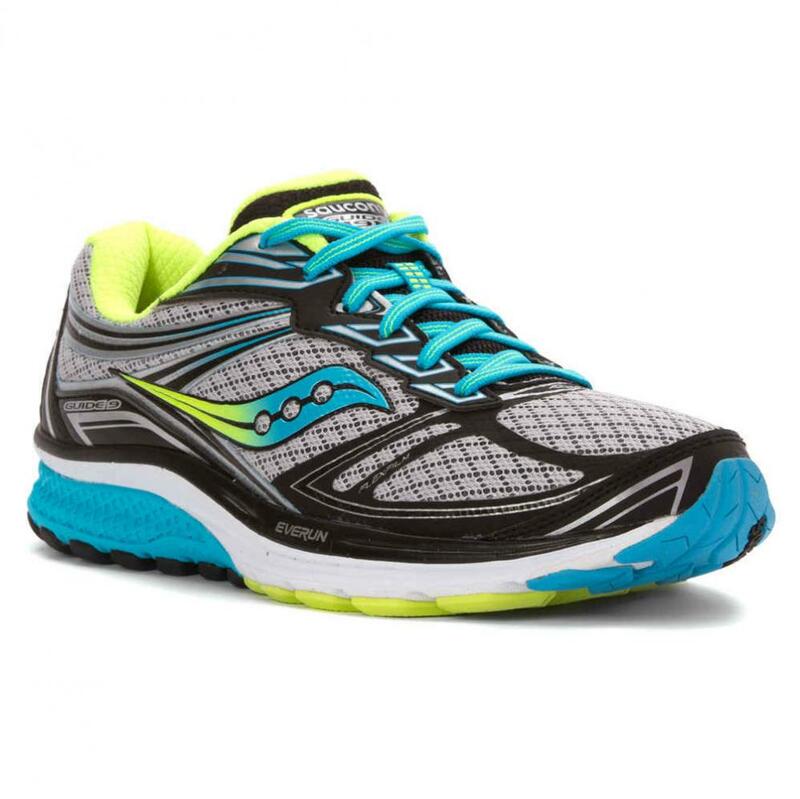 Why buy Saucony Guide 9 running shoes for arch support? 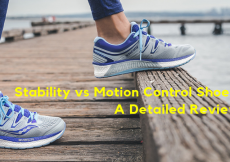 Stability vs Motion Control Shoes: What’s the Difference? 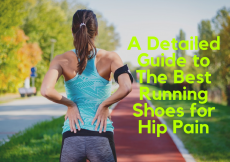 What are the Best Running Shoes for Hip Pain? Find Out Here.